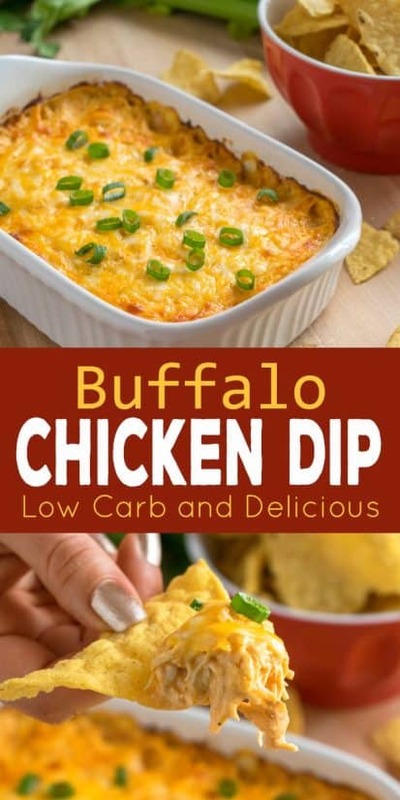 Buffalo Chicken Dip tastes just like buffalo wings dipped in ranch dressing and is crock pot friendly. This recipe is also low carb and no mess with all the flavor of the real thing! 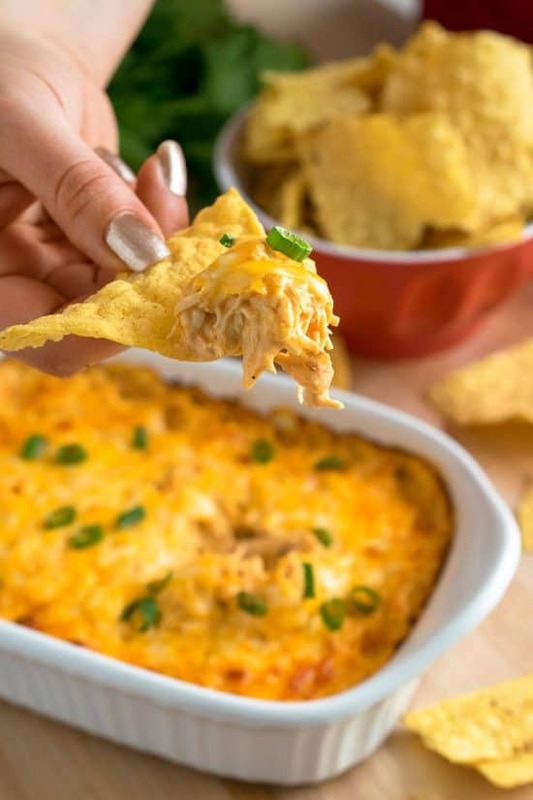 We love quick and easy dip recipes and potluck recipes around here like our Bacon Pepper Dip, Supreme Chicken Nachos, Punch Bowl Cake, and Corn and Black Bean Dip. Dips are one of my favorite things about the football season and and makes it easy to put in the crock pot and far less mess. With Superbowl coming soon, I thought I would share one of our go-to recipes that is always a hit! Buffalo chicken dip is the perfect appetizer to serve a crowd, especially when you don’t want messy wings. Made with grilled chicken, authentic wing sauce, ranch dressing, and melty cheese, this dip is a crowd pleaser. Or maybe you want to keep it for yourself and who could blame you, lol. It is also easy to make ahead! If you are working on your new year’s diet, this recipe can also be Keto friendly if served with celery or red pepper strips for dipping. Or cut calories by using light cheese and swapping light sour cream for the mayo. Crock Pot Buffalo Chicken Dip or Bake? Both variations are equally delicious, but I do like a melted cheese topping with a little bit of crisp browned cheese. Of course, the crock pot makes it easy to keep warm for parties and munching during the football game. Really, you can’t go wrong either way. How long does Buffalo Chicken Dip Last? I honestly don’t think I have ever brought leftovers back from a get together. However, at home, this buffalo chicken dip recipe will last for 3-4 days if refrigerated. Wrap tightly or store in an appropriate sized container. Of course, don’t leave it out in the sun or at room temperature for more than two hours. If you want to mix it up the night before and add it to the crock pot the day of, that is perfectly fine. Just give it a good stir. I don’t recommend freezing the chicken dip because the dressing ingredients will separate. You can freeze the cooked chicken, then defrost it in the refrigerator the day before you make the dip. As I said, this recipe is very friendly for low carb diets, Keto, or Adkins diets. The biggest issue you may have for low carb diets is what to serve with the recipe for dipping. I would personally serve it with celery If you are wanting to cut calories, you could swap the mayo for more light sour cream and use light cheese. Lower fat cream cheese could also work, but the dip may be a bit less thick. The dish is very flavorful on its own, and I have been possibly known to just grab a spoon, haha. However, one of my favorite ways to serve is at parties with crackers, tortilla chips or serve with cut up celery and bell peppers. It really is a wonderful flavor that tastes just like buffalo wings! It has always been a hit at parties. This recipe is a great substitute when you don’t want the mess that wings create. I seriously keep going back for more because it is so good. If you are more of blue cheese dressing fan than ranch, you can easily swap the dressings. Serving this dip is so easy on your upcoming party appetizer table. I usually make sure to set the ingredients for dipping in bite size to prevent double dipping. I also often include sample sized plastic cups and serving spoons on the side so that everyone can self serve easily. How Do You Make Buffalo Wing Sauce? Combine in a sauce pan over medium heat. Stir until the butter melts and is completely incorporated. Allow to cool. An easy way to shred the chicken is you can throw it in a stand mixer with a paddle attachment like this one or an electric mixer and beat on medium-low speed. This recipe takes a total time of 5 minutes to throw together if the items are prepped. It is also a great recipe to make ahead. I generally use pre-made wing sauce such as Sweet Baby Ray’s. If you like a hotter sauce, you could add Frank’s original hot sauce or even a bit of Tabasco. I am not a huge fan of hot flavors, so I’d recommend going easy on this until you get the flavor you want. There is a difference between hot sauce and wing sauce for making buffalo sauce. I don’t recommend substituting wing sauce for straight hot sauce. Buffalo Chicken Dip tastes just like buffalo wings dipped in ranch dressing and is crock pot friendly. This recipe is also low carb and no mess with all the flavor of real wings! Turn slow cooker on low heat. Add all ingredients except 1/2 cup of colby jack cheese. Mix until well combined. Cover the crock pot and cook on low for 1-2 hours. I like to grill or saute the chicken. This brings out the most flavor. While you can boil the chicken, it does add more water content and the chicken is a little less flavorful. An easy way to shred the chicken is in a large stand mixer, like a kitchen aid, with a paddle attachment if you have one. If you don't want to use a slow cooker, this recipe can also be baked. Preheat oven to 375, and use a 9x9 baking dish. Bake for 30 minutes or until cheese is completely melted, hot and bubbly. Serve warm. For dipping, serve with tortilla chips, celery, or red pepper strips if you want to keep it low carb. Wow! This was fantastic and tasted just like buffalo wings. I did add a bit more hot sauce for my tastes.